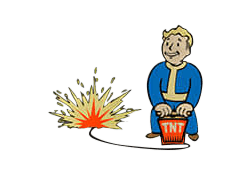 Demolition Expert is a Perk in Fallout 4. It is associated with the Perception Stat. Rank 1: The bigger the boom the better! Your explosives do 25% more damage, and you can craft explosives at any Chemistry Station. Rank 2: Your explosives do 50% more damage, and grenades gain a throwing arc. Rank 3: Your explosives do 75% more damage and affect a larger area. Rank 4: Your explosives do double damage. Mines and grenades shot in V.A.T.S. explode for double damage, too.